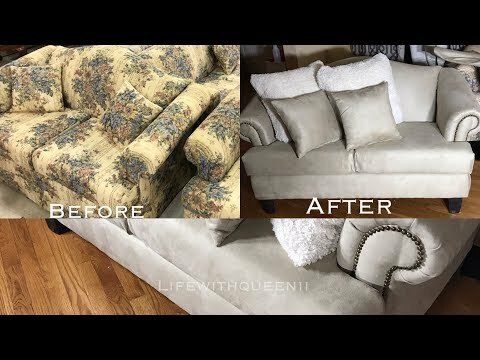 Whether you have an older sofa that’s seen better days or just made a new thrift store purchase, you can have it looking brand new again with new upholstery. Before you bust out the nail gun though, there are a few things that you want to keep in mind. We’re giving you some practical tips and tricks to keep in the back of your mind as you reupholster your couch. Before you apply the new fabric to the couch, make sure that you take plenty of photos of it. This will help to have an accurate view of how the sofa looks before you disassemble it. 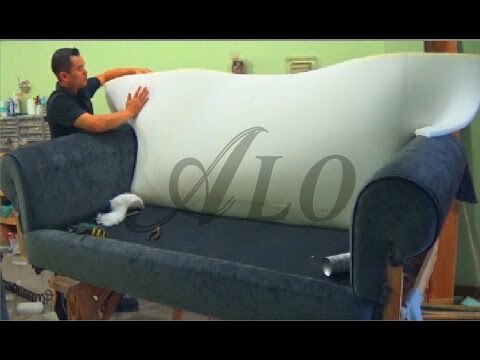 Since you’ll be removing the arms of the sofa, legs and other parts you can go back and reference these pictures as you work on this project. If you don’t want to take pictures of the sofa, you can also use a permanent marker to make notes on each part of the sofa. Noting the parts will make it easier to figure out what it is and save time instead of trying to guess what goes where. Now you’ll need to disassemble your couch so you can begin to add the new fabric. You’ll want to be careful during this part so that you don’t lose any bits that you need later—like stuffing. Turn your sofa over to easily access any nails or screws that will be removed. Set these different parts off to the side and place any screws into a cup or Ziploc bag for safe keeping. You will also need to remove the old covering from the cushions, arms, and sofa frame. Be sure to remove all or as many nails as possible. Do You Need More Filling? Now that you have everything exposed, this is a prime time to check out the cushions to see if the stuffing needs to be replaced. If so, then you will need to add it as you cover the cushion with new fabric. You could, of course, measure out each part of your sofa to figure out how much fabric is needed. However, you don’t have to reinvent the wheel when it comes to figuring out the dimensions of your sofa. Using your old fabric, lay it over the new fabric to create your template. Make sure that you give around .5” of space on seamed edges and 2” to 3” for fabric that will be stapled to the sofa. This will ensure that you have enough to stretch over the wooden parts of the sofa. Once you have your fabric template completed, it’s time to sew the pieces together. Make sure that you are using a thick, heavy-duty thread that is specifically meant for upholstery. Otherwise, you’ll find that the fabric will not hold together for very long. Using a sewing machine will make this project much easier. When using this machine, be sure that you have a strong enough needle that won’t break while sewing the fabric together. For this part of your upholstery project, you’ll need a strong staple gun to attach the new fabric to your sofa. These can be purchased inexpensively from hardware stores or online retailers. To make sure that the fabric stays taut and in place, you’ll need to place the staples close together while stretching the fabric. After this is done, you can move on to the final step. Now that the fabric is back on the sofa, you can put everything back together. Starting with the largest parts of the sofa, you’ll reattach the bottom and back. You’ll then reattach the arms to the sofa frame. If you have any trouble remembering what goes where reference the photos that you took before disassembling the sofa. Reupholstering a couch is a more labor and time intensive project, but one that is well worth it. You can avoid spending a ton on a brand new sofa. Salvaging furniture and turning it into a new piece will save money and give new life to an old piece.